On hot sticky days, Sonic has been my go-to refreshment for years. A Route 44 Diet Cherry Limeade. YUM. 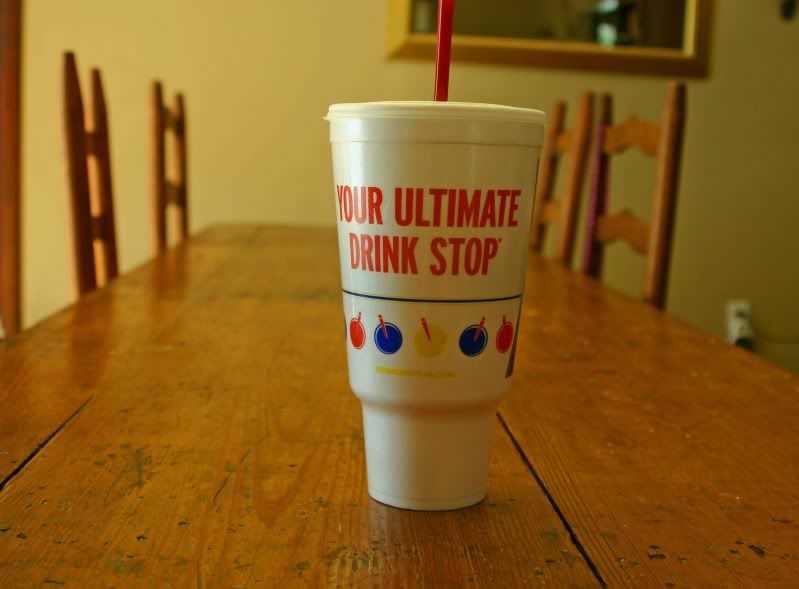 Or a Route 44 Diet Cherry Dr. Pepper, for an afternoon caffeine fix. Yeah baby. But, a while back my friend Jen told me I had to try their Mango Limeade. Holy mama, Jen knows what she's talking about!! It is amazing!! And 1/2 price drinks during happy hour (2-4pm)? We're there. Oh and when you're in a mood to be really naughty? Try the coffee milkshake, called a Java Chiller. If you want to get real crazy, you can even have an extra shot of espresso, called a Sonic Boom. Funny story - when we lived in Colorado Springs a few years ago they did the happy hour thing. I think they were a test market for Sonic. Then we moved to Kansas. I went to Sonic one day, pushed the red button and said, "Do you have happy hour?" There was a long pause and then the 17 year old girl came on the speaker, laughing, "Ummm, ma'am? This is Sonic. We don't serve alcohol." *sigh* I tried to explain it to her but I don't think she believed me. Yep, you got me hooked on Sonic. :o) Rt 44 Barq's Slush. I think we now have happy hour here. I loooove strawberry limeades from Sonic. Yum! Ha ha... Ma'am this is sonic... we don't serve alcohol. HA HA HA. Yeah, but they should be controlled substances just the same. I miss the blackberry iced tea, but raspberry will do in a pinch. The new Mango Limeade is wonderful! My husband and I usually hit up happy hour at Sonic on the weekends. They are building a new Sonic just a block from my office, and that makes me very happy! Pity me. I've never been to a Sonic. Never even seen one. I love their cherry limeade, my fav! And the orange cream slushie is awesome, too! I love Sonic!!! Their Mango Cool Breezes are good too! My favorite in the morning is a Rt. 44 Cherry Vanilla Dr. Pepper. You MUST try diet cranberry too-my new fave and THE BOMB! that is so funny about the happy hour! we LOVE happy hour! my son loves their slushes so we'll go at happy hour & i'll get him an "incredible hulk" slush (that's what he calls the green one) and i get a strawberry limeade. but mango limeade??? i'm gonna have to try that! i love that the small slushes are only $0.50 during happy hour! Your story cracked me up! That story is TOO funny! mmm.mmm.mmm....LOVE me some Sonic Crush Ice! I'm going to try the Mango Lemonade! Sound delish...and too funny about your little "happy hour" story. I love to go through Sonic if I'm out and about at HH! Your Happy Hour story is so funny! When I was in college in Hays way back in the early 90's the Sonic had happy hour. Then as we moved around I was surprised to find out they all didn't have it. It was a huge bummer when we lived in North Dakota because there weren't any Sonics. I've not tried a Mango Limeade but I did have a Mango Cool Breeze last week that was very yummy! Those sound wonderful right about now. Im a sucker for fruity drinks in stryafoam cups! That is a great story! Hee, hee. Beki, I think we think alike. You know, the last time I went to Sonic it was when my son was at a birthday party and so I took my older daughter for a special treat...it was right at the end of their happy hour (which is two hours, isn't it? What's up with that?) I asked for a whatever slushie (can't remember) and do you know she said,"We're all out of slushies." WHAT? We were sad for two seconds and then she saw the m&m milkshake...things turned out fine. Ha, ha. Enjoy your drink and your day! I TOO AM IN LOVE with mango limeades. In fact, you've inspired me to go and get one later today -- after Luke's nap. What a great post! awesome... just what I needed to hear to push me to try the mango limeade. I always revert to my old faithful cherry limeade! so glad I stopped by! Amen to Sonic! Although my drink of choice is the vanilla coke! Those drinks sound amazing! I thought of you today, I got an amazing curry but then they dumped a load of fresh coriader (cilantro?) on top - ugh!!! OK, so all you Kansas blogging gals keep bringing up SONIC............never been, never heard of it, and Sonic should TOTALLY pay you for advertising! I love the happy hr story, that is hilarious! Next time I come to visit the Beverlins we MUST go to Sonic. We don't have one near us in California. I laughed so hard at your story!! =) SO funny! My kids & I LOVE Happy Hour at Sonic too!!!! For those of you who don't have Sonic, you have GOT to come to Kansas (or anywhere in the midwest, really) and try it! we just had a sonic open up here....so i will have to go try it. Did you really live in Co. Springs? I lived in Castle rock! lol small world.